Enlisting the help of my Dad, Robert, we have decided to embark on a homebrew mission; to recreate Mikkel’s original coffee oatmeal stout recipe: Beer Geek Breakfast. The beer that put Mikkeller on the map is rated as the best stout in the world on RateBeer; perhaps an ambitious undertaking for two novice homebrewers, but we have decided to rise to the challenge. As the name suggests, the beer was designed to be the ultimate breakfast stout. Brewed with pilsner, oat, smoked, cara amber, brown, pale chocolate and chocolate malts, as well as roasted barley and flaked oats, it’s a stout with an incredibly complex malt bill. Coming in at 7.5% ABV, it is brewed with Cascade and Centennial hops and gourmet French press coffee. Now brewed for Mikkeller by the Norwegian beer lords at Lervig, it is one of the most widely respected beers in the world. Brewing it here in our office, I’m not sure it will live up to this reputation, but with so many delicious components I’m sure we’ll make a great brew in any case. The first step was to collect the ingredients from our friends at Edinburgh’s Brew Store (brewstore.co.uk). Excited by our undertaking, they share some advice over a couple of glasses of their own recent creations, including an awesome lemongrass saison. They told me that this is one of the most popular beers for their customers to try and emulate, “make sure you bring us a bottle to try once it’s done!”, they said. Loaded up with an array of malts and back at base, I’m standing over a simmering Grainfather full of water. I pour the malts into the steaming liquor and my Dad stirs to avoid creating a clumpy mess. We let the machine do its thing for an hour, emitting a wonderful malty aroma, while we taste last month’s brew - David’s New England Grapefruit IPA. After an enjoyable hour critiquing my colleague’s homebrew, it’s soon time to sparge for half an hour; the point in the process where we slowly trickle additional liquor through the grain to wash out any lingering sugars. While we wait, my Dad reminisces about some of his earliest memories of beer: “Your Grandad used to brew his own beer in the garden shed. He was a very thorough guy, so it seemed to turn out pretty well,” he says. Channeling this attention to detail, we carefully measure out the bittering hops and add them to the boil. Another 45 minutes passes and we add 45g of Centennial, boil for another 10 minutes and then add another 45g, along with just 10g of Cascade for the final 5. “This sure is a carefully thought out recipe,” we remark, wondering how much of those ten grams we’ll be able to perceive in our finished beer. The finished wort tastes incredibly bitter, with an amazing array of malty characteristics; chocolately, smokey, biscuity goodness. We add the American Ale yeast and let it get to work on this magically dark brew. The carboy bubbles vigorously in the corner of the office for a fortnight, “that is some happy yeast!” I hear Richard exclaim. I brew the coffee and add it to the batch a few days before bottling. My Dad and I can’t wait to crack into these bottles together in a few weeks; we might even pick up a bottle of Mikkeller’s original, to compare with and see how much more we need to improve! COMMENTS 0.5 litres ground coffee made with 50g coffee added a few days before bottling. 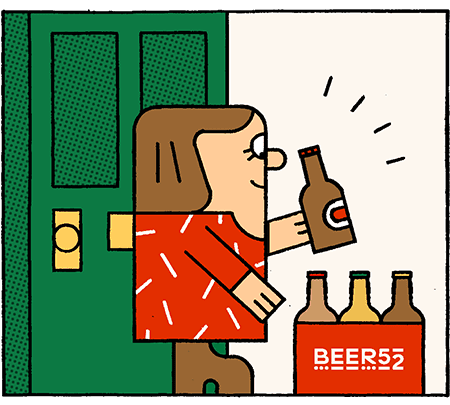 David Laird, Ferment’s advertising manager, gives his verdict on last month’s brew: a New England IPA Unlike James Taylor’s Honey and Basil brew from the last issue, my now bottled beer didn’t open with a ‘pleasant fizzy pop’. I had no pop, no fizz, and it wasn’t pleasant! However, the aromas that filled the air around my oddly inert NEIPA were still as fruity and as pungent as when I first brewed it; the taste, the body, the colour was to me nearly perfect for my pallet! But where was my ‘pleasant fizzy pop’? I rang my experts at our Home Brew suppliers and was reassured; leave it! A few more days it will be fine! So was it all fine? I hear you all tentatively asking from beyond this page, well no is the short answer: my NEIPA was dead on arrival. I went to Hop City in Leeds last week and was asked to bring a few bottles to share with a few brewers. So, imagine my utter dejection at having Seb Brink, head brewer at North Brew Co, be the first to pour my now ready homebrew, on pouring I knew there was something wrong instantly; my NEIPA was no longer bright radioactive orange, nor was the room filled instantly with the leftovers of the insane amount of fruit I placed in it. It was a dull brown with a tint of green, it had no real smell and tasted very much of cardboard. Two days was all it took to go from near perfection to death, and we may never know the reasons why! (I believe internal sabotage). I think in a way it’s been a good death though. I have come to really appreciate just how fragile and frustrating brewing can be! That in the small amount of time a small change in a recipe can make such a difference. I do plan to brew again and now I can do it with my eyes wider open than before.